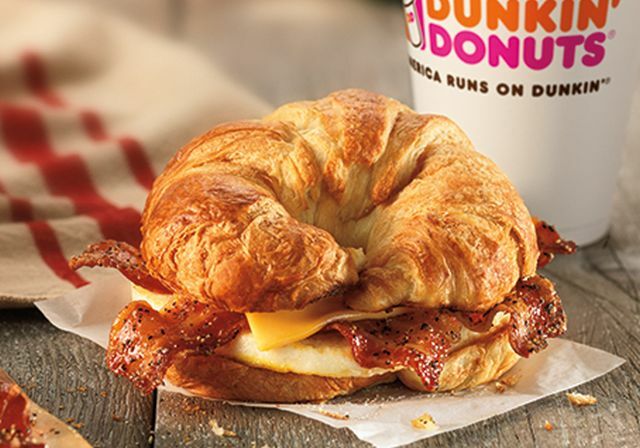 The Sweet Black Pepper Bacon Breakfast Sandwich returns to Dunkin' Donuts for a limited time this winter at participating locations nationwide. The sandwich features four strips of bacon coating in a brown sugar and black pepper seasoning, egg, and a slice of American cheese on a toasted croissant. For those with a smaller appetite, it's also available as a Wake-Up Wrap, which consists of half an egg, a slice of American cheese, and two slices of brown sugar and black pepper-seasoned bacon folded in a small flour tortilla. Select Dunkin' Donuts locations will also be offering the new Santa Donut--a donut with red icing and chocolate icing "belt" topped with a powdered sugar Munchkins donut hole--through the end of December.